A part of the Ninth grade classical core curriculum, the Prentice Hall Algebra II text book provides full coverage of all traditional algebra II concepts and skills. The beginning of the text reviews concepts from algebra I before adding new concepts. The Algebra II Quizzes and Tests Key provides answers to the Algebra II Quizzes and Tests Book. The Algrebra II Quizzes and Tests provides challenging questions that will help reinforce what the student has been learning from the Prentice Hall Algebra II Textbook. Invite a master teacher from Highlands Latin School into your home to teach your student algebra! 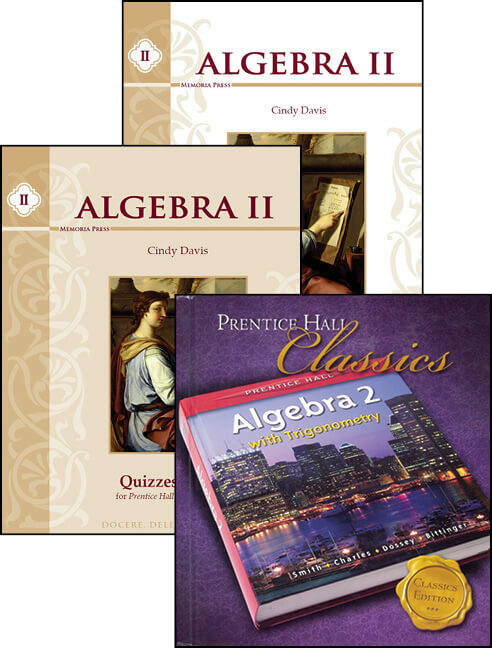 Cindy Davis will walk your child step-by-step through Prentice Hall's Classics Edition of Algebra II. Cindy will go with you anywhere you have internet access. This product is a 13-month membership that gives you unlimited access to stream the Algebra II Instructional Lessons. If you have already purchased a 13-month membership but need more time, simply purchase this product again before your membership expires for a 13-month extension of your membership at 25% off, automatically applied at checkout. If your membership has already expired and you need an extension, please call us at 877-862-1097 to receive the discount. Access membership information on your My Account page under the Streaming Courses tab. *Videos require internet access to watch. For more information, see our Streaming Video FAQ. This Algebra II set includes the following: Prentice Hall Algebra II Textbook, Quizzes and Tests, Quizzes and Tests Answer Key, and a 15-month membership to Online Instructional Videos. We really like this program. It is exactly what we needed this year. The lesson plans are just right, the videos and note taking guides are helpful and the text is good for self teaching. It is far better than any of the written for homeschool programs, has just enough challenge to be interesting, teaches to mastery with just enough review to keep skills from fading. We did find and purchase a solutions manual so I can answer questions easily if kiddo misses a step or doesn’t know where she went wrong.